Glynn Gregory was an all-state and all-American running back who played a key role in three state championships and a national record-setting 49 consecutive victories at Abilene High. He was also an all-state catcher on the baseball team that won two state titles, an all-district basketball player and ran a 9.8 100-yard dash in Abilene's summer track program. 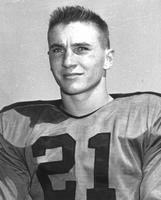 A great runner, kicker, blocker and defensive star for the Eagles, he never played in a losing game in high school. As a senior in 1956, he ran for 1,142 yards, caught 19 passes for 553 yards, passed for 82 yards, and scored 22 touchdowns plus 56 extra points, and was considered one of the nation's top recruits. Former Abilene teammate Dr. Stuart Peake, who played with Gregory in the National High School All-Star Game that year, remembered him as "the greatest natural athlete I've ever known -- and the most modest." Gregory went on to star for SMU and then played for the fledgling Dallas Cowboys in the NFL. He died on Feb. 14, 2013, at age 73.